Harvard University has returned a Sikh student’s kirpan as a result of the Sikh Coalition’s intervention. The student, Navdeep Singh, had voluntarily given his kirpan to a University administrator who requested that the administration be able to keep it while the university determined whether he would able to wear it on campus. The student’s kirpan was returned to him within hours after the Coalition’s intervention. Tags: Sikh, kirpan, Harvard, religious freedom. A Mosque in Loughborough, Leicestershire was vandalised in the early hours of Friday June 16. An object was thrown at one of the windows at 5:50am leaving the mosque with £70 worth of repairs. Over two years as many as nine teenagers broke into and stole money from the Islamic Center of Naperville, but the teens were motivated by greed, not racial or religious intolerance, police and mosque officials said Wednesday. Four 18-year-olds were arrested last week, and police intend to obtain arrest warrants for five more teens within the week for burglarizing the mosque in the 400 block of Olesen Drive, Lt. Dave Hoffman said Wednesday. Racism, xenophobia and far-right extremism are on the rise across Europe, according to a comprehensive survey which found that Muslim communities face mounting discrimination and prejudice. The report, by non-governmental organisations in 20 EU countries, criticises governments for losing interest in the battle against racism, and says the political reaction to terrorist attacks has made life harder for ethnic minorities. People who worship at the Dashmesh Darbar Sikh Temple on Oakhill Ave SE in South Salem say the violent and destructive acts committed against their building over the weekend amounts to more than a hate crime, they say it was an act of terrorism. A second legal complaint filed against the man accused of rolling a frozen pig's head into a Lewiston mosque is raising the question: Will there be a third? Thursday's decision by the Maine Attorney General's Office to prosecute Brent Matthews of Lewiston on civil rights violations has mosque members hoping that the federal government will follow. Local prosecutors at the Androscoggin District Attorney's Office first charged Matthews, 33, with the misdemeanor crime of desecrating a place of worship. The state, in its civil lawsuit filed Thursday in Superior Court in Auburn, claims Matthews broke the law because his alleged action targeted Somali and Muslim residents and was motivated by bias based on "race, color, ancestry, national origin and religion." Tags: Maine, Attorney General, mosque, pig, immigration. Tags: Muslim, Glasgow, airport, discrimination. A flagpole at the Dasmesh Darbar Sikh Temple in South Salem was uprooted and the flag was burned Saturday morning in what temple members called a hate crime. Members found the remains of the flag about 6 a.m. The 4-foot-tall flag had a Khanda, the primary symbol of the Sikh faith, printed on it. The flagpole had been removed from a stump on the back of the property, in which it was anchored, and brought just outside the temple's chain-link fence, where it was set ablaze. Flowers also were ripped out, and a nonworking bike was thrown to the opposite side of the property. Angry Indian Muslim leaders claim their community is the target of a witch hunt by police investigating the Mumbai train bombings last week which killed 183 people and wounded 800. A white man accused of pummeling a black man over the head with a baseball bat was sentenced to 15 years in prison Monday in a hate-crime case that focused on the defendant’s use of the n-word before the attack. Weighing against Minucci [were] two violent youthful offender convictions, including a hate crime from 9/11 when he shot a paint ball at a Sikh man about to go into a temple and pray for World Trade Center victims. Mr Ahluwalia, giving evidence in court, said... "I heard someone shouting across the road. There was a man copying my body movements. British prosecutors Monday declined to seek criminal charges against two London police officers who shot and killed a Brazilian electrician last year after mistakenly identifying him as a suicide bomber. “We take these cases very seriously,” said Wendy Osborne, a spokeswoman for the FBI in Indianapolis. On July 2, Porter County police received a report of bullets shot into the center’s copper dome, leaving six holes. Also, two glass doors, 10 windows and a spotlight were vandalized, possibly by a BB gun, according to a police report. UK Muslims blame Islamophobia on the portrayal of their religion in the media, a survey has revealed. 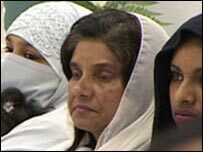 The report by Shaista Gohir, from online forum Muslim Voice UK, stated: "The Muslim-West relations have become increasingly strained due to a string of events such as the September 11 attacks in 2001, the Afghanistan war in 2002, the Iraq war, the London bombings in 2005 and the Danish cartoon row. "In this current climate, it is essential to gauge Muslim and non-Muslim attitudes with a view to resolving differences." Hundreds of Muslims have been questioned by police in the Indian city of Mumbai following last week's serial bombings. Suspicion has fallen on the Lashkar-e-Toiba, a Kashmiri militant group based in Pakistan, as well as radical Islamic groups based in India prompting the security agencies to concentrate their inquiries on the city's Muslim community for any leads. This has created a growing sense of uneasiness among the city's four million Muslims, who have come out in strength to condemn the attacks. Mumbai has a history of tensions between the city's Muslim minority and Hindu majority, although initial fears of a backlash targeting the community have proved unfounded. In mosques, Friday prayers were dedicated to the victims and the condemnation of the blasts has been unequivocal. No display of anti-Muslim rancour has so far surfaced, but in a majority-Hindu country, Muslims remain scared of a backlash or police harassment. Forensic experts have confirmed the bombs were left on luggage racks and all had timers, though they've yet to identify the explosive. Many people have already made up their minds where blame lies. This protest in Delhi today. The home ministry has suggested it was the work of Lashkar-e-Taiba, the Pakistan-based terror outfit fighting Indian rule in Kashmir, working with a local, banned Islamic group. Amid the grief here, there is impatience for results, but there is a danger of a serious backlash if the police are heavy-handed in Mumbai's Muslim communities. Rajinder Singh Khalsa lay on the ground praying to God as the next man’s foot exploded into his face, opening another wound. Silently, he pleaded for the punches and kicks to stop, for the pain to end. The five men beat him viciously outside of Villa Russo’s Restaurant in Richmond Hill because of the turban on his head. He suffered a nose fracture, temporary loss of vision in his left eye, and was left on the ground unconscious. July 11 marked the anniversary of the date that Khalsa, now 51, endured the racially motivated beating. It is now two years later, and the five men were all dealt prison sentences, ranging from five days to two years. Three of the men were also ordered to serve community service with the Sikh temple. Khalsa, meanwhile, has carried on with his life. His vision is still poor and he frequently suffers from neck pains. Through his faith in Sikhism and support from the community, he has been able to maintain his spirit. Last year at this time, Khalsa announced that he filed a civil suit against his attackers, making him the first Sikh hate crime victim to do so. On Saturday, Khalsa was contacted by Allstate Insurance, which had been providing homeowners’ insurance to three of the men. Allstate informed Khalsa that they would not cover the suit because the men engaged in an intentional violent act of crime. A Sikh transit authority employee has unwillingly emerged as the poster boy for the very dress code he says violates his religious freedom. The station agent, Trilok Arora, 68, and four other agents sued the Metropolitan Transit Authority last year over its requirement that they wear an MTA logo on their turbans. Since May, employment attorneys for the Department of Justice — which filed its own lawsuit against the dress code — have sent four letters to federal court protesting the transit authority's use of Mr. Arora as a model for the logo-laden turban. Mr. Arora's lawsuit alleges that the MTA is lax about enforcing its dress code prohibiting employees from wearing Yankees and Mets caps, but targets Sikhs to hassle them about their religious headwear. His lawyers claim that the MTA has no right to place its "corporate brand" on the religious garments of its employees. There are now two challenges that now lie ahead of [Indians]. One is the obvious one that India's law-enforcing agencies face, to act pro-actively and nimbly to outsmart terrorists who can strike anywhere and at any time. The other is for civil society, which must refrain from the temptation of giving a religious dimension to such terrorism, regardless of the communal biases that sections of it may nurture. Governor Baldacci says Maine is no place for discrimination or harrassment. As he spoke at the opening of the new state Office of Multicultural Affairs, the Governor responded to a crime committed in Lewiston last week. Police say Brent Matthews has admitted to rolling a frozen pig's head into a mosque last Monday night, during a crowded prayer service. Police say Matthews told them he did it as a joke. But Somali community leaders say it was highly offensive, and so does Maine's governor. A constant bombardment of images of Osama bin Laden has compounded trouble for American Sikhs who faced racial hatred in the wake of al-Qaeda attacks in the United States on September 11, 2001, a Washington-based Sikh advocacy group said today. Sikh Council on Religion and Education (SCORE) chief Rajwant Singh cited a survey his group had carried out in Washington on the levels of awareness among Americans about their understanding of the faith. Comments by Tory Politician on Muslims "Offensive and Divisive"
The Australian Government has spelt out bluntly what it expects of its ethnic minority communities and we in the UK should do the same," [Sir Nicholas] Winterton wrote. "They should stop politicising dress, such as wearing the hijab and burkha, they should learn English, they should not return to their homelands to get a spouse, cease forced marriages and accept once and for all that the United Kingdom is not, and never will be, an Islamic state." The director of the local Racial Equality Council, Shantele Janes, said her office was extremely concerned by the article. "We are appalled that someone in his position would be so irresponsible as to make the comments he did, contributing to the climate of hostility towards Muslims in the UK," she said. [F]ears of a dramatic change in non-Muslim attitudes to Muslims [did not] materialise. A recent survey by the Pew Global Attitudes Project found that 63% of non-Muslim Britons have a favourable opinion of Muslims, barely down on the 2004 figure. Those attitudes were more positive than in the US, Germany or Spain. To illustrate the contrast, two years after the Madrid bombings, only 29% of Spaniards have a benign view of Muslims. In Britain, less than a third said they viewed Muslims as violent, compared to 60% in Spain and 45% in the US. It was a sledgehammer blow to Britain's multi-cultural society - yet a Welsh Muslim leader believes July 7 has brought us closer together. Saleem Kidwai, secretary of the Muslim Council of Wales, gave the Echo an exclusive interview to mark the first anniversary of the London bombings. Researchers at Glasgow University have been studying how the majority of Scots feel about people who live in Scotland but who are "not like them". They used social attitude data to gauge "street-level prejudice" among majority Scots, a group that excludes Muslims, English immigrants and their partners. They concluded that there was less Anglophobia than Islamophobia. The findings, published by the Scottish Centre for Social Research, show that 49% of those polled held negative rather than positive views of Muslims. The comparable figure for English immigrants was 38%. Behind the headline figures, there is a wealth of apparently contradictory attitudes. Brad Adams is the Executive Director of the Asia Division of Human Rights Watch (HRW). HRW is the largest human rights organization based in the US and protects the human rights of people around the world. Rajvinder Singh Bains is a Punjab & Haryana High Court attorney with over two decades of human rights litigation experience. He is the lead attorney of the Khalra trial team. Sandra Coliver is a Senior Legal Officer at the Open Society Justice Initiative an operational arm of the Open Society Institute founded by financier George Soros that promotes the rule of law and human rights worldwide. Matt Eisenbrandt is the Litigation Director at the Center for Justice & Accountability (CJA). CJA works to hold human rights abusers accountable through lawsuits brought under universal jurisdiction laws. Carla Ferstman is the Director of Redress. Redress helps torture survivors obtain justice and reparations. Ram Narayan Kumar is the Director of the South Asian Orientation Course in Human Rights and Peace Studies, a program of the South Asian Forum for Human Rights (SAFHR). SAFHR promotes human rights, peace, and democracy in the region. Smita Narula is the Faculty Co-Director at the Center for Human Rights and Global Justice (CHRGJ), based at NYU School of Law. The CHRGJ focuses on issues related to global justice and emphasizes research productivity in all aspects of its work. Vasuki Nesiah is a Senior Associate at the International Center for Transitional Justice (ICTJ). ICTJ assists countries pursuing accountability for past mass atrocities or human rights abuse. said British Muslims are not confronting the ideas that fuel terrorism, after one of his lawmakers criticized the government's response to last year's attacks on London. In the anniversary week of the July 7, 2005, bombings when four British Muslims killed 52 people in suicide attacks on London's transport network, Sadiq Khan, a Muslim lawmaker in Blair's Labour Party, said the government had not done enough to engage with Britain's Islamic community. "The problem is not that the government hasn't acted," Blair told a committee of lawmakers in Parliament today. "The problem is that we're not having a debate of a fundamental enough nature within the community, where the moderate majority go and stand up against the ideas of these people, not just their methods." Sixteen per cent of [respondents], equivalent to more than 150,000 adults, believe that while the attacks were wrong, the cause was right. The predictions were wrong. British society, and London in particular, rose above crude revenge. Politicians, faith groups and ordinary citizens reached out to the Muslim mainstream in support, sharing their bewilderment and supporting them in the painful selfexamination of why their faith had bred such violence. There were some isolated hate crimes, but no general spiral into communal violence and entrenched hostility.